Day 13: Craving coffee and still missing chewing gum. 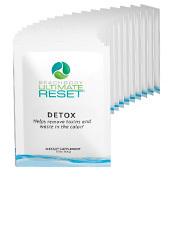 Okay, the Ultimate Reset (a 21 day cleanse) has been a roller coaster of energy and emotions! Yesterday I was cranky and frustrated. Today I felt energized and bubbly. My father is visiting, and so I spent the afternoon doing things with him and the boys. We went to Barnes & Noble, and Target, so he could spoil the boys with gifts. At Barnes & Noble, there was a Starbucks, where my dad ordered a coffee and a yummy non-coffee frozen drink and pastry for the boys. The smell of brewing coffee and pastries almost did me in!! I brought my Power Greens with me, but I didn't have my afternoon snack (my Vegan Shakeology), because I wasn't teaching any fitness classes, nor did I do any yoga or walking so I was pretty hungry by dinner, where my dad and the boys ate chocolate cake!! It looked incredible, but I know I'm doing this cleanse, and sharing the journey has kept me accountable, so I didn't eat a bite!! I was so tempted by that darn chocolate cake!! But don't worry, I stayed strong! Thoughts: I'm not hungry, after eating this, but I miss eggs and oatmeal. 2 hours later: 24 oz water with Mineralize, and Detox and Optimize supplements. Thoughts: I want chicken, or hardboiled eggs, or crumbled feta on my salad!! It's not that I'm hungry, all the food is filling me up, but I just want variety! 2 hours later: Power Greens powder with water. No Shakeology snack, today. A light workout, yoga, or a walk is not in my schedule today, so I'm sticking to the Ultimate Reset plan of no snack! Oh, do I miss it!! 5:30 pm: 24 oz water with Mineralize, and Detox, Soothe, and Optimize supplements. 6:30 pm: Dinner -Roasted Acorn squash with Miso Tahini Sauce and spinach. Thoughts: This was so delicious and filling! I'm not usually a squash person, but I would have this again!! Lucky for me, it's on the menu again for this coming week - haha! Day 12: Bored of vegetables. The exhaustion is back and so is the crankiness! 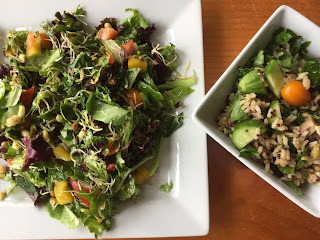 While I feel amazing and am noticing significant results on the Ultimate Reset (21 day cleanse), I'm becoming increasingly irritated by all the meal prepping and cleaning! I'd say that's the #1 drawback to this. You have to spend a lot of time in the kitchen cooking and prepping...and then cleaning! But this is how you're supposed to live and eat. I have to keep reminding myself that we need to get out of the "microwave mentality." I'm so sick and tired of microgreen salads for lunch! I LOVE salads and vegetables, but I'm missing chicken, eggs, or even a sprinkling of goat cheese on my salads! I'm down 6 lbs, my digestion has never been better, and I feel great, so it's clearly working. I have zero bloat, even after I eat. This weekend is going to be challenging since I have family visiting. But I don't want to "cheat." So I guess I'll make my own foods and avoid all the temptations! Thoughts: Blah....tasteless soup, tired of this salad, just bored of this food. Thoughts: Seriously the best part of my day, and helps quell my sweets cravings!! Thoughts: This is THE WORST dinner so far! The only good thing was the rice/quinoa blend. I had to choke down the vegetables. I don't like beets, they taste like eating pure soil to me, and I don't like collard greens. I love most vegetables, and these may be the only two I don't like....And they both appeared on the menu for the same meal!! Yuck! Thanks for tuning in! See you tomorrow! Day 11: More than halfway done!!!! Today I almost scrapped the whole thing!!! I was cranky, tired, hungry, and wanted all the food!! I promised to keep it real, on the Ultimate Reset, this 21 day cleanse. Today was the first day I was really hungry. I took my work outside, today, and enjoyed the beautiful weather, and that put me in a better mood. But the cravings were still there! This afternoon when I was making peanut butter toast for my son, I wanted to eat it. I thought "one piece of peanut butter toast won't hurt." My mouth was salivating. But I didn't take even a bite. 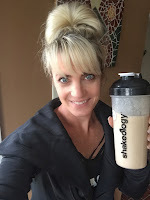 I quickly made my Shakeology, drank it, and busied myself with my to-do list.....it worked!! I taught my Cardio Barre class today, and even though I've been teaching my classes with low impact and low intensity, my body can feel it! I'm not supposed to exercise during this cleanse, but there is a modification for fitness instructors, and that is to have a snack between lunch and dinner. I choose Shakeology every day!! Thoughts: while I love all this fresh fruit, I'm missing something to go with it, like yogurt, oatmeal, or eggs. Thoughts: The quinoa lentil pilaf is filling. Perfect lunch, but for some reason, today I was hungry! Thoughts: Bland and tasteless. I couldn't even finish the vegetable miso soup! I'd rather not eat - lol!! Wohooo! I made it to day 10! This week is ROUGH! Last week I had plenty of food and no cravings. But this week....I'm not going to lie, I wanted all sorts of food today! I was craving pizza, chocolate, bread, chicken, eggs, and of course chewing gum!! However, I drank a glass of water, and then distracted myself and the cravings went away. AND I have tons of energy and am noticing increased mental clarity, and I want those both to stick around. Thoughts: OLIVES!! I get to have olives today in my salad!! And this soup is delicious!! Filling and satisfying. 2 hours later: Power Greens powder with water (I squeeze a little lemon in this and chug)! Thoughts: the most delicious part of my day!! Thoughts: I'm sick of lentils too! They are just mushy and tasteless. Again, thanks so much for following this journey! See you tomorrow! I had this on Day 9 and Day 10 of the Ultimate Reset and it made my meal! Thick, but light, with fresh, grated, ginger giving this soup a bit of zest! So easy to make. This soup is gluten free, dairy free, egg free, paleo, and vegan. Peel and cube sweet potatoes. (I left the skins on for the sake of time). Cook in boiling water until tender. Drain and set aside. Meanwhile, roast a whole red bell pepper on gas stovetop, or grill, turning frequently until evenly charred on the outside OR in your oven at 400 degrees for 15 to 20 minutes, turning every 10 minutes or until skin is charred. Put pepper in bowl and cover with towel for 10 minutes to steam. (I skipped this step, again, because of time). Place sweet potato, pepper, broth or water, ginger, oil, and miso in blender. (If you want chunky soup, set aside some chunks of pepper.) Blend thoroughly, adding more liquid to achieve desired soup consistency. Transfer to a pot and gently heat on low until hot. Add tamari or aminos, salt, and seasoning as desired. I'm going strong on my 21 day cleanse (the Ultimate Reset), but today, while I was picking up a few items at CVS, I passed by the Easter candy on sale, which got me thinking about, and craving, chocolate! Then, before my 4:30 pm Insanity-P90X Mash Up fitness class I teach, I REALLY wanted my afternoon cup of coffee! Both for the shot of caffeine energy and for warmth (it was cold rainy and dreary today). But, I'm almost halfway done, and I'm going to keep going. No wine, no coffee, no treats, no cheats! I'm sipping on some herbal tea as I write this and feeling really good! the classes because I feel incredible! The biggest victory I'm noticing is in my tummy. No bloat, no gas, no heartburn, no food baby after a meal! Thoughts: So delicious and colorful, but I couldn't finish it all! noon: Lunch - Microgreen salad with rice and pinto beans. Thoughts: Thank goodness for the rice and pinto beans, and for the pumpkin seeds on the salad. I almost didn't want to eat it...just bored of it! Thoughts: YUM! 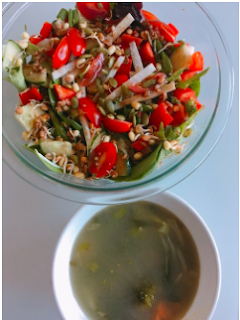 The soup was delicious (click for the recipe), and I get to have this soup again for lunch tomorrow, which I'm super excited about! And I love roasted asparagus!! During this second week, I take Detox three times per day along with the other supplements I took in week one. Day 8: Energy and more energy! Heyyy friends! Today was the best day yet on the Ultimate Reset, my 21 day cleanse. I'm down 4 pounds and I am feeling energized! I'm still freeeeezing! 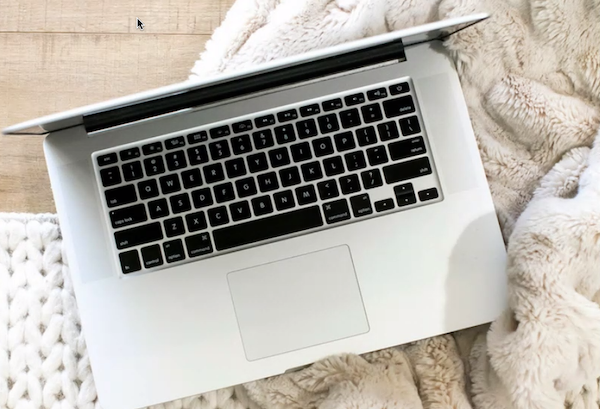 I wear a fleece sweatshirt every day, and I sat next to my space heater while I worked today. At night, I used to wear just a little cotton nightie, and now I go to bed fully clothed. I'm in full length PJ's and socks (a side effect my hubby's not happy about - LOL)!! Phase 2, the Release Phase began today. This means I start taking the Detox supplement 3x per day, 30 minutes before each meal. The Release Phase completely eliminates animal products, including dairy, eggs, and meat. Thoughts: doesn't it look gorgeous? All those vibrant, fresh colors!! It's a pleasure to eat, BUT, I couldn't even finish all of it! I did't eat about a quarter of it. I was stuffed! Thoughts: I love salads, but I'm getting a little tired of this one. I wish I had some chicken or tuna on this. Again, the pumpkin seeds make this dish! Thoughts: The best part of my day today! Keeps my cravings for sweets away, and I love this new flavor!! Thoughts: The pinto beans and rice were yummy, and while I steamed the green beans, the thought of steamed zucchini make my stomach turn. The dinner also called for 2 tsps of EVOO, so I used one on the steamed green beans, and I used the other to toss in the zucchini and roast it. So much better! It was my son's birthday, today, and I picked up some yellow cupcakes. BUT, I didn't eat one bite, and yellow cake is one of my FAVORITE foods! I remembered my goals and my commitment, and how I'd feel if I ate one!! This is a recipe I had on Day 6 and Day 7 of the Ultimate Reset, a 21 day cleanse, I'm doing, which I started the Monday after Easter. 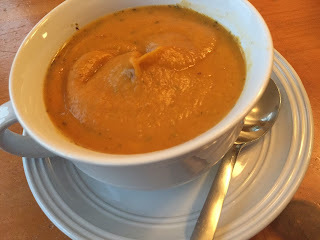 This soup was one of the recipes that saved me! Creamy, and flavorful, I wanted to make 4 more servings! It's also easy and quick to prepare, although the cashews have to soak for at least an hour. But I set them aside, went and did other things and let them soak! The recipe below is for one serving. 1. Soak cashews in enough water to cover for 1 hour. 2. Boil one cup of water. Add chunks of zucchini to water and continue to boil about 4-5 minutes. 3. Combine cashews, cashew water, drained zucchini, salt or aminos, and dill in blender and mix until smooth, adding water as needed for desired consistency. **For chunky soup, add steamed chopped vegetables of your choice. **Can also be served cold. **I thought I added enough dill, but when I made a second batch I added even more and it was much better! The exhaustion from yesterday subsided a bit, but I'm still dragging, and still wishing for coffee or Energize to perk me up! Also, my chewing gum cravings also subsided, except for after a meal. I still want a piece after a meal to cleanse my mouth. I brush my teeth instead, but I still want the gum. I almost gave in, today, and had some Energize to give me an extra push. BUT I DIDN'T!! AND, I'm not hungry AT ALL! I don't crave sweets, and the thought of eating anything greasy, like pizza, or Chinese food makes my stomach turn. My digestive system feels amazing, and I know those foods would make me sick. But I really want coffee! Since the sun was shining and the temps were comfortable, I walked around the soccer field for an hour with my younger son, while watching my older son play soccer. Perfect day for it! 9:30: Breakfast - Oatmeal with ground flax, blueberries and cinnamon, and plain yogurt drizzled with honey. Thoughts: This may be my favorite breakfast of all time. I will miss it over the next two weeks! Thoughts: I'm getting a bit tired of the microgreen salad, but I see it's on the plan for the next two weeks. But the salad is so filling! It's actually 3 cups of greens plus a ton of other veggies and pumpkin seeds. The soup was creamy and I added more dill for flavor. Delicious! Click for the recipe! Thoughts: It wasn't too bad. I like broccoli, and the plan allows for 2 tsp of olive oil and Himalayan sea salt, which I put on the broccoli. The tempeh was okay. I'd rather have a piece of seasoned chicken or fish, but it's better than steamed kale! That's a wrap on Phase 1: Reclaim! Onto Phase 2: Release tomorrow! Today on the Ultimate Reset (a 21 Day Cleanse), I was exhausted. I helped my husband hang some pictures in his office, did a yoga workout, did some work, and snuggled up with my family and watched a movie. I'm not sure if it was due to the rainy, dreary weather, but I was dragging all day! I read that this is a common side effect, so I'm hoping it passes soon! What I would do for a cup of coffee or some Energize! I weaned myself off coffee a week before I start, so I wouldn't have caffeine withdrawal symptoms, but man I miss my Saturday morning ritual of coffee and reading a book. Then sometimes if I have an afternoon where I'm dragging, I treat myself to a cup of coffee...I feel a little down without it! I'm definitely mourning my afternoon coffee date with myself! As for the morning, I actually don't miss it so much then! BUT, my digestion is probably the best it's ever been and I've lost 3 pounds!! Tomorrow is the last day of Phase 1 and next week we eliminate all animal protein. I don't mind so much, but I will miss eggs and yogurt. Thoughts: I would NEVER eat this breakfast by choice! The tempeh was better than I expected. The recipe calls for marinating it before cooking. The avocado was just too plain by itself, and the steamed kale...I hope to never have to eat a piece of steamed kale again! Blech! I choked it down! Thoughts: The only thing that saved dinner was the soup! I don't like beets, I'm not a fan of sweet potatoes, and I can't stand cooked carrots. So, I choked those down. The soup was creamy and delicious. A little bland, but creamy and decadent in texture, so next time I make it I'll put more dill it in. Click here for the recipe. I made this recipe when I was doing the Ultimate Reset (a 21 day cleanse). I LOVE this recipe. Eat it hot or cold, bring it to a picnic or summer potluck. The flavor was fresh because of the mint and parsley, but had a tang from the olives and lemon juice. It was one of the delicious recipes that got me through the Reset. Combine quinoa, oil, and lemon juice, plus salt, in a medium bowl; mix well. Add tomato, cucumber, and olives; toss gently to blend. Let salad marinate, covered, in refrigerator for 2 to 3 hours before serving. If you are interested in the Ultimate Reset, or would like more recipes like this and support in your health and fitness journey, or to be considered for one of my accountability groups, fill out the form below. Day 5: I feel great! I got this! First, I'd like to thank everyone for following my journey, and sending me thoughtful, encouraging messages! You guys, motivate me, and help me keep going! Today, I felt great! I felt light, and energetic! I've taught 9 fitness classes this week, and had plenty of energy to get through them, so my modifications are working! I'm adding in a daily snack of Shakeology, which is eating more than on the Reset plan, but I don't want to feel run down, or get too hungry, so I'm adding that extra snack! I taught 2 fitness classed today: Boot Camp at 6 a.m., this is when I REALLY miss my Energize, and then a TRX class at 9:30 a.m. Then, I came home to work, clean the house, and walk the dog. Plenty of energy to do all of this, AND ----> I'm NOT HUNGRY!! 9:00 am minutes later: Breakfast - Farina cereal with apple and walnuts. Thoughts: If you don't know what Farina is, it's just another name for Cream of Wheat or Cream of Rice. I didn't even have to buy it, because we already had it in the cupboard. However, I don't care for walnuts, so I substituted pecans, and the recipe called for maple syrup, which I also don't care for, and I didn't think it needed any sweetener. The apple made it sweet enough. It was a bit cool here this morning, so it was the perfect warm, comforting breakfast. 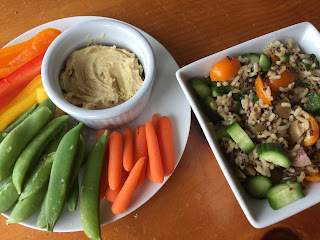 Thoughts: LOVED the Quinoa Salad Recipe! (Click for the recipe). It was flavorful with the olives, parsley, and mint. This keeps me from craving any sweets, and gives me that extra energy for my fitness classes. Thoughts: We had activities for the boys from 5:30 pm to 6:15 pm and then again from 7 pm to 8 pm. So, instead of coming home for dinner, my husband and the boys wanted to go out for pizza. I brought my veggie stir fry, rice, and miso soup with me. While the pizza place smelled delicious (one of the best smells there is), I didn't even want it. My digestive system is running smoothly, I feel light and energetic, I didn't want any greasy pizza weighing me down. 9:00 pm: My husband and I sat down to watch TV and he made air popped popcorn as a snack. It smelled so good, and now I was a little hungry. So, I did have one cup of blueberries just so I wouldn't eat the popcorn. This is a specified snack on the Reset, so I still stayed on track. 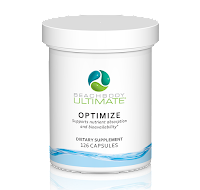 I take Optimize capsules 3x a day, as specified on the plan. I'm off to bed! The Reset has really made me tune into my bodily processes and when I need sleep. And it is a WHOLE cleanse, and recommends putting away technology and TV before bed, and reading a book or practicing mindful breathing instead! G'night! Day 4: I can do this! I'm doing pretty good - oh, wait, should I eat this graham cracker? Even though I had zero energy today, it's not because of the Ultimate Reset (21 day cleanse), it's because I went to bed too late for two consecutive nights and because last night I was up all night with my sore knee. No time for a nap today with my crazy schedule, but I stayed strong.....EVEN when I met a friend of mine at the Waffle Shop for breakfast. We were supposed to go to Starbucks, where I planned to order a cup of tea, but she hadn't eaten breakfast, and even though I had already eaten my 3 cups of fruit, I met her, and still only had caffeine free tea!! Never did I think about ordering pancakes or waffles or bacon! I'm determined! However, I was really late with my lunch - I didn't get to eat it until 2:30 pm!! After breakfast, I did errands, had physical therapy, and taught a fitness class. As I was driving around in my car all day before I had lunch, I noticed my son had left one graham cracker in a baggie in the back seat...I knew it was still hours until I could eat lunch. I thought about eating it: "It's just ONE graham cracker...." BUT, I knew if I ate that, I wasn't staying true to the process. I am committed! I missed chewing gum much less today. I miss it most after a meal, when I want to freshen my breath, and get the flavor of what I ate out of my mouth. So, now I brush my teeth. Not quite the same feeling, but the results are the same. With this post, I will start giving info about the supplements I take daily. Below, after the menu, check out today's description of Power Greens. 9 am: Breakfast - Three cups of fruit. Doesn't it look gorgeous and colorful? AND, greek yogurt drizzled with honey. Thoughts: I DO NOT LIKE LENTILS!! They work in a soup, but they are just mushy and tasteless prepared this way... The sushi roll was tasty, full of veggies, avocado, and smoked tempeh. I did miss the soy sauce, ginger, and wasabi, though. Thoughts: Delish dinner! 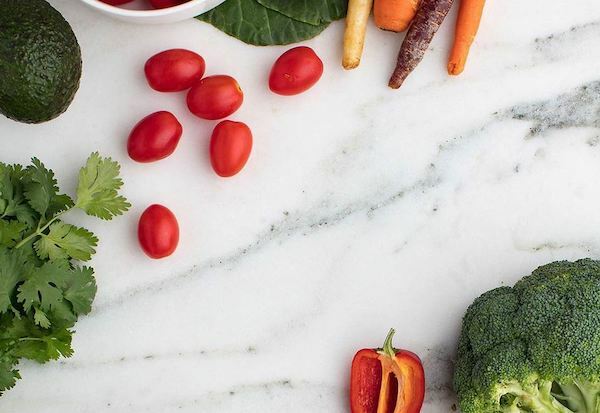 The stir fry is made with sesame oil, liquid aminos, and himalayan sea salt. And the tomato-cucumber salad had chopped fresh herbs in it - tasted like a fresh, summer dish!! 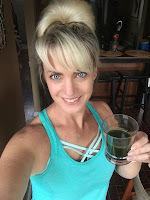 Power Greens is a combination of six powerful greens, including kale, cucumber, celery, spinach, Matcha green tea, and chlorella, each known for providing their own unique benefits, and now brought together to form the perfect "green team." Many people don't like the taste, but I mix it with a squeeze of lemon, and I don't mind the taste. It has a grassy, earthy flavor, but not overwhelming. Day 5 coming at you tomorrow! Overview of the day: I woke up to teach my 6 am Boot Camp class and I was exhausted because I went to bed too late! I was REALLY missing my Energize (my pre-workout drink), but by the time I came back home, I felt great! Full of energy, and just felt "light!" I started feeling more mentally clear and accomplished most of my "to-do" list!! This is my third day on the Ultimate Reset, a 21 day cleanse. The spring weather is a bit rainy and cooler than the past few days, and I was cold all day, but this is a common side effect. I missed my chewing gum less today, so that helps A LOT! I stilled missed it at certain moments, mostly after meals. I would chew gum to freshen my breath and cleanse my palette. Since I'm not chewing gum, I've decided to brush my teeth after each meal. That means I'm brushing 4 times per day, but that will mean cleaner teeth!! A bonus side effect. LOL! I love that I've been able to conquer this unhealthy habit. If someone had told me that I'd stop chewing gum, I wouldn't have believed them! If you've been following me the past few days, I've been posting about what I eat an also the supplements I'm taking that come in the Ultimate Reset kit. I'll give detailed information about the supplements in my coming posts, but today I included info below about the Power Greens supplement. 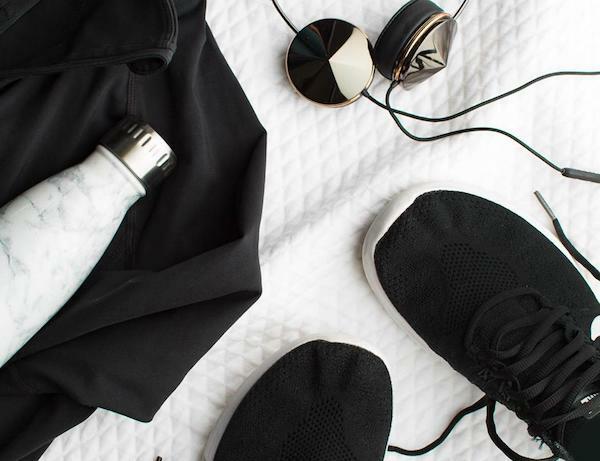 You're not supposed to exercise while doing the Ultimate Reset because your internal body is doing a lot of work and you don't want to take energy away from your organs by exercising. However, a 20-30 minute walk or yoga is recommended! Because I teach fitness classes, I do mostly demonstrating in the classes, and modify the moves. Being the instructor allows me to do that; "it's not my workout, it's your workout," I tell my class. 😉 I also modify by having an extra snack, as the program specifically recommended for fitness instructors! But since I had the energy, I did the sneak peek of the upcoming new Beachbody workout You V.2. It was SO MUCH FUN!! It reminded me of the fitness classes I used to teach when I first started teaching. If you love dancing, and want to have fun without realizing you're sweating, check out this video!! This workout will be released on Beachbody On Demand in May, so that is super exciting! So today's challenge was timing. I was so busy, that I didn't get home to eat dinner until 8:45 pm, and forgot to take my pre-dinner Optimize and Soothe until 8:25 pm, so I didn't wait the 30 minutes I should have, but by that time I was hungry! Being cold! This is a side effect mentioned in the Ultimate Reset booklet. As my body releases the toxins, and I chug water all day, it makes me cold. So, I worked all day with my space heater beside me!! Hoping it gets better soon! Thoughts: I put the kale and the eggs on the toast like an open faced sandwich. This made the toast seem less dry and I was able to eat the kale! Thoughts: I've eaten lentil soup before, but made like this, they were mushy and bland! I didn't enjoy them at all! Still love the microgreen salad and the pumpkin seeds make the dish! I have a KitchenAid Cook's Mezzaluna I bought on Amazon and I used it today to chop the salad. It made it delicious, a perfect balance and blend of ingredients! 2:30 pm : Power Greens powder with water - these are tough to get down. A bit like a glass full of pureed grass. BUT, I added a squeeze of lemon to my glass and it made it easy to drink! Thoughts: Even though the sushi roll, didn't really come out like a roll (it sort of fell apart when I cut it), it tasted ok. A little bland, but filling, and loved all the textures of the rice, crunchy veggies, and creamy avocado in the roll.